When you ask someone to marry you, you're embarking upon a lifetime commitment. That kind of commitment demands a sign of your devotion, which is why humans invented engagement rings, those circular symbols of promise. Whether it's gem-encrusted or an understated band of gold, the right engagement ring is the ideal way to express your feelings for your bride-to-be. But, how do you find the right engagement ring? Unless you're lucky enough to inherit an heirloom, you're in for a hard choice at the jewelry store. Fortunately, there are some broad rules you can keep in mind when picking out engagement rings. Your first task is to make sure you know what your girl likes. By this point, you should be well versed in her preferences and dislikes. If she's allergic to silver and you offer her a silver engagement ring, you can expect some awkward moments. Why allow yourself even that minor chance of disappointment? Your next goal is to choose the very best engagement ring you can afford. You might ask "How much should I spend on an engagement ring?" The generally accepted rule for engagement rings is to spend about two months' wages. That may seem like a lot but it's not considering what you're getting in return. As for the engagement ring itself, it should possess the best possible combination of three features: it should be easy to wear, attractive, and durable. An engagement ring is easy to wear if it doesn't slip and slide and doesn't have to be forced on; so, make sure you know your girlfriend's ring size. This might not be easy to determine without giving the game away but you can do it if you're careful. 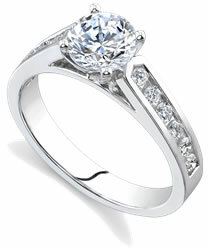 As for its attractiveness, you should pick an engagement ring you think your girlfriend would like. Remember, conservative always trumps flashy. A plain gold engagement ring with a single marquis-cut stone is simple, elegant, and stunning; a half-inch band encrusted with pearls may seem tacky. As for durability, pick a metal for her engagement ring that will wear well and tightly fastened stones that won't get in the way. Remember that while 24-karat gold is beautiful, it's also comparatively soft. Everyday usage can deform it and cause it to wear away over the years. If you have your heart set on a gold engagement ring, opt for 14-karat, which is 60% gold alloyed with a harder metal such as zinc or silver. Better yet, try platinum; it's not that much more expensive than gold. Silver, on the other hand, costs significantly less. When it comes to choosing stones, go for the big time. Diamonds, rubies, and emeralds are ideal for engagement rings. They are among the hardest substances on earth and will resist chipping, cracking, and breaking. More important, however, may be the setting you choose for her engagement ring. If your girlfriend works around machines or in a high-risk neighborhood, large stones are out. Otherwise, bezel settings are recommended; they tend to be lower-set and more secure than claw settings, making it easier to keep her stones and, in some environments, her fingers.